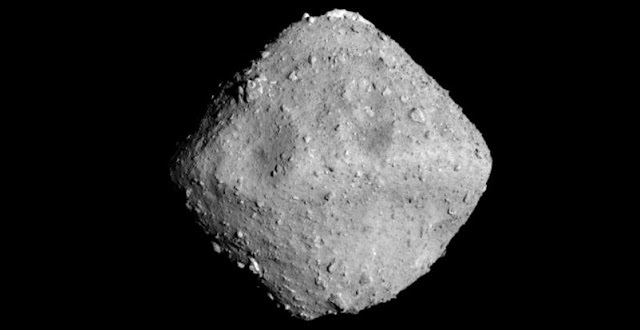 As Japan’s Hayabusa2 drew closer to its target Ryugu asteroid, a strange new planetoid came into view – but one with a somewhat familiar shape. This distinct ‘spinning top’ asteroid class has been seen repeatedly in recent years, and might give a foretaste of things to come for ESA’s proposed Hera mission. Hayabusa2 is currently just 20 km away from the 900-m wide asteroid. The view from its navigation camera reveals a spinning body with an enlarged ridge of material around its equator – a bulge suggesting Ryugu may once have been spinning much faster. As ESA’s space scientist Michael Küppers followed Hayabusa2’s approach he recalled Europe’s own asteroid first encounter, just under a decade ago on 5 September 2008, when Rosetta performed a flyby of the Šteins asteroid en route to its final destination, comet 67P/Churyumov-Gerasimenko. “At 6 km across, Šteins was much larger, but had a similar diamond shape,” says Michael. “Personally I wasn’t surprised to see this again with Ryugu, because it has turned up with many smaller asteroids in recent years. The Yarkovsky–O'Keefe–Radzievskii–Paddack effect, named after four different researchers who worked on asteroids, is triggered by the warming of asteroids by sunlight. The asteroids re-radiate this energy as heat, which gives rise to a tiny amount of thrust. Eventually Newton’s Third Law – ‘every action has an equal and opposite reaction’ – exerts itself. And due to their irregular shapes, some parts of asteroids generate more thrust than others, leading to a turning force like wind past a windmill. Today Michael is serving as project scientist on ESA’s Hera mission study, planned as humankind’s first mission to a binary asteroid system if approved at next year’s ESA Council meeting at ministerial level. His role is to work with external scientists to come up with mission requirements, and make early plans for operations and data analysis. Hera’s target is the Didymos system, with a 780 m main body orbited by a smaller 160 m ‘Didymoon’. NASA’s DART spacecraft will impact this smaller body in 2022 to measurably shift its orbit, ahead of Hera’s arrival in 2026 – the two missions combining in an audacious, full-scale planetary defense test. Rosetta’s exploration of Šteins – then in 2010 the mammoth 100 km-diameter Lutetia asteroid – took the form of brief flybys as it sought its main target. Hera would be surveying the Didymos asteroid for a prolonged period. “First and foremost Hera would be a planetary defense and technology demonstration mission, but there would also be a lot of chances for what I call ‘ride-along’ science. “For instance, the crater formed by the DART impact would allow us to survey pristine subsurface asteroidal material that has not undergone any weathering by micrometeorites, the solar wind and space radiation. That might allow us to find an analogue for it from collections of meteorites that have previously landed on Earth, boosting our understanding of its make-up.